If you are looking for a great deal on a refurbished used Macbook, GainSaver is the place for you. Our amazingly low prices beat the competition every time. And our huge selection of discount priced Macbooks are ready to deliver with GainSaver's 30 Day Money Back Guarantee. For shopping tips on how to find the best offers on a Macbook that fits your budget, read on! On the Macbook category page you can see all of GainSaver’s refurbished used Macbooks displayed on the right side of the page. There are several ways you can view the list of Macbooks to quickly find what you’re looking for. At the top of the list you’ll see a row of options you can click on to change the way the list is displayed. Click on the View menu to select the number of Macooks listed at one time. Select the Page number to advance or return to a page within the list. If you have selected to view 25 Macbooks per page, then Page 2 shows the next 25 Macbooks from 26 to 50. You can change how the products are displayed with the Grid and List buttons. The List View is the default. This view shows one Macbook at a time down the list. In the Grid View, you can see them displayed three across, depending on the size of the screen you are using. You can sort the list to show the refurbished Macbooks in order of price, or alphabetically by name. Product information from buyers is a great resource to help you find the best value. You can sort the Macbook list view by Best Sellers and see which refurbished Macbooks laptop models are the most popular with GainSaver customers. And you can sort by Reviewed to see which Macbooks have the most reviews. This is a great way to discover what other owners have to say about the cheap Macbooks they bought from GainSaver. If you are looking for a particular model of refurbished Macbook laptopn, you can quickly find it by using the search feature. Enter any part of the product name or description you are looking for, such as the manufacturer’s part number, model name, product description or some characteristic of product. If you enter multiple words, all of words must be found in the product description for it to appear in the search results list. Only items found in the current category will be displayed in the results list. You can see the current category in the left side of the Search Box. If you like, you can open Category List and select a different category to search. GainSaver has a wide selection of discount Macbook laptops on hand and ready to ship. The GainSaver website is designed to help you quickly narrow your product search to find the items that most closely match what you are looking for. Down the left side of the GainSaver website product listing pages, you’ll see a collection of links that help you limit the product listing to specific types of products. While you are shopping in the Macbook category, you'll see many different filters you can use to narrow your search to just the Macbooks you are most interested in, such as the introduction date, color, processor speed and price range. To view only Macbooks that were introduced in particular year, click on one of the Introduced links, and only th Macbook laptops from that year will be displayed in the list view on the left. Near the top of the navigation pane on the left, you’ll see the best deals within the current category under the heading Shop Deals. Click on Best Sellers and Reviews to see what other GainSaver customers are buying, and what they have to say about their cheap refurbished GainSaver Macbooks. 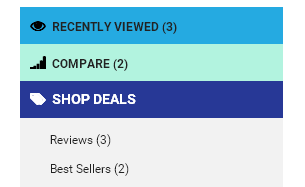 You can also sort products in the listing by Best Sellers and Reviews, but when you click on one of these Shop Deals links, only products that are Best Sellers or have Reviews will be displayed. You can also limit the product listing to only those items that are On Sale, Price Dropped or include Free Gift Cards. On Sale items are discounted from the regular GainSaver low price from 5% up to 20% off. Price Dropped products contain the most recent price drops. These change often, so make sure to check out the Price Dropped items every time you visit the site. Gift Cards and included with the purchase of these items. You can use your Gift Card on your next purchase to save you the amount of the card, which range from $25 to $50. Gift Cards never expire, and can be applied to any future purchase you make. The breadcrumb under the menu bar shows where you are in the GainSaver website. When you click on the links in the left navigation panel to limit the items displayed in the category list view, the breadcrumb grows longer. You can take a look at the breadcrumb to see all of the navigation filters you have applied. You can use the breadcrumb to help you navigate the GainSaver website and change the filters. To remove one of the filters you have applied, just click on the X next to the name of the filter. To go back, click on the link of the filter you want to go back to. When you do this, the filters to the right of the one you clicked are removed from the list. Any time that you click an item and view the detailed information for that used Macbook laptop, the GainSaver website saves that item for you in the Recently Viewed list. The Recently Viewed list is like an automatic browser bookmark that you can use to go back to the used Macbooks or other products that have already caught your attention. if you want to go back again and see the products you've viewed already, you can click on the Recently Viewed link at the top of the left navigation panel. One of the most useful features of the GainSaver website is the ability it gives you to compare different computer systems next to each other. When you see a used Macbook laptop or any other product you might want to look at again, click the Compare button. This saves the item for you. When you click on Compare, the button changes to Remove. When you are finished comparing that item and don’t want to see it again, click Remove. Once you have one or more items to compare, just click on the Compare link at the top of the left navigation panel. Only those items that you have chosen to compare will be listed. You can view them in a list, or you can click on the Grid button to switch to Grid View. Grid View is a great way to compare items, and makes it easy to see prices and features side by side. When you click on any laptops in the refurbished Macbook category list view, you will be taken to the detail view for that model. Here you can see additional specifications and customer reviews. You can also see questions other shoppers had about that model, and even ask a question yourself. In the detail view on the right side of the screen is the GainSaver Configurator. One of the most important reasons you should buy GainSaver refurbished Macbook is that GainSaver will custom configure your order to your exact specifications. Just select the options you want for your used Macbook in the Configurator. You can order a custom hard drive, memory upgrade, optical drive and the version of the Mac operating system you want installed. You can even have your Macbook specially configured with both Mac and Windows dual operating systems ready to use out of the box when your Macbook arrives. All you need to do is select that option in the Configurator. Just below the Configurator is the total price. 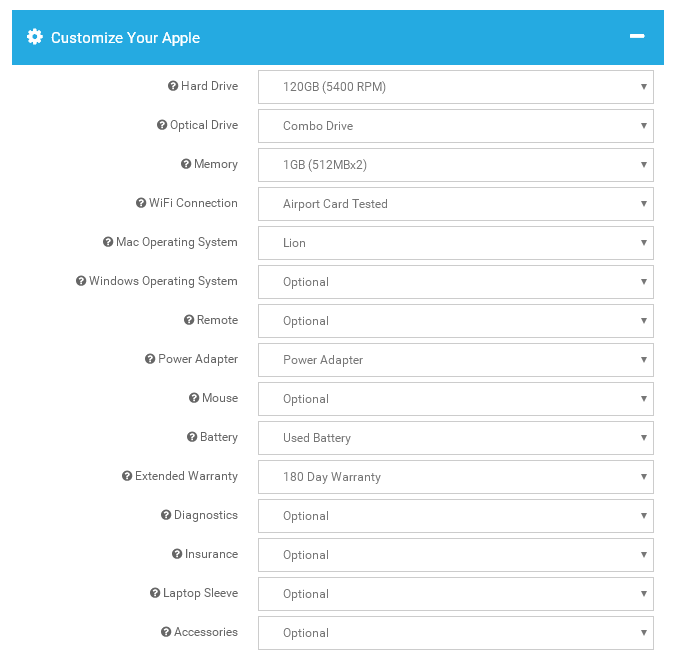 Any changes you make in the custom configuration of your Macbook are shown in the price. Once you have completed the configuration and you’re ready to order, click the Buy Now button to add your refurbished Macbook to the shopping cart. GainSaver guarantees your satisfaction with the refurbished used Macbook you order from GainSaver. And we provide all the tools on the GainSaver website to help you find a Macbook laptop that meets your system specifications at the lowest price anywhere.